Every child is unique in their own way, but handling the responsibilities that come with raising a special needs child can often feel like a juggling act for parents. 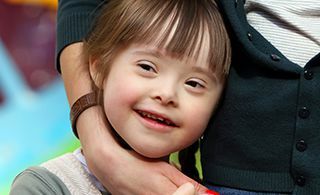 All too often, pressing medical and developmental issues can force proper dental care to take a back seat – this is why studies show that children with special needs are almost twice as likely to experience oral healthcare problems. At Pediatric Dentistry of Prospect, our team has experience with these kinds of cases, and we enjoy being able to help your family members with physical, developmental, emotional, or behavioral conditions smile brighter than ever through treatment that’s always patient and kind. After dental school, Dr. Danielle actually underwent a year-long fellowship at The Underwood and Lee Dental Clinic. This facility in Louisville, KY provides an oral healthcare home to adults with significant mental disabilities, and her time there gave Dr. Danielle a unique insight and skill set. Today, she is well-equipped to continue treating your special needs child through their adolescent years and into the adult ones. Contact our Prospect, KY practice today if you have any questions or concerns, or if you’re ready to schedule a first visit! New patients from River Bluff, KY and surrounding areas are always welcomed.